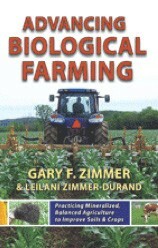 Gary F. Zimmer and Leilani Zimmer-Durand Zimmer is recognized around the world as one of the leading authorities of biological farming. Adjusting for different soils, a farmer can use the interaction of a perfect balance of inorganic minerals, organic materials, and living organisms to foster natural chemical reactions that feed plants perfectly. Books ship directly from Amish-Mennonite bookstores using old fashion mail order systems shipped through the US Post Office. Electronic tracking numbers will not be available. Just let us know if you don’t receive a book order within 7-10 business days.